Thanks again to Le Tune and Rakeback for the free roll! After dominating the tourney early, I ran into sets three times to eliminate myself in 12th out of 36. Played very well early, me thinks. I'm certain Le Tune thought I was deliberately raising his blind every time because of the bounty, but I actually had a hand every time. For those that are interested, I laid down QQ86 when Spaceman re-raised me all in. I think that was a horrible lay down based on my M and the odds. I still think he had me beat, but it's Omaha. Is anyone really that far behind? 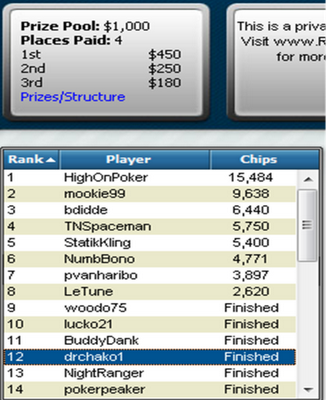 Thanks to BamBam for railing me. HUGE apologies to CK for the massive river suckout. I meant it - the first lap dance is on me. I would need a signed waiver from The Wife first. Are you kidding me?! She'll be right there! You kicked azz my man! Well.... until like a 12th. place finish. Thanks for the 'other' fun last night! We do need to talk 'puter speed though! I mean..... I really thought mine was Sloooooooow! Ha! 'Lap dance on me... literally.' Ha! That's just good comedy there. Hey, I went with Matt and the roommate up to Rascal's for their Thursday evening deepstack tourney last night, and took down first place for ~$600 (+ satellite entry to a monthly freeroll.) I really foresee it becoming a routine, in case you're down to join us on a future Thursday night, let me know. A $60 entry, nice structure (10K chips 15 minute levels,) nearby location, fun atmosphere... good times. I had AKT8, double suited, when I repopped you. I was raising mainly to play the hand heads-up against you since there was already so much money in the pot, not so much to get you to fold. But I'll take a laydown any day. :-) It was good playing with you!